more progressive….Switching the tax base to one focused on pollution and consumption is hardly a panacea, but it really would be a huge step forward relative to a system based on wages and income. Ultimately, whether or not we make that shift one of these days is going to be a bigger deal than whether we fully extend the Bush tax cuts or only mostly extend them. A couple of things about this. First, when you talk about consumption taxes most people think of VATs and sales taxes. Roughly speaking, though, you can make the long-run effect of an income tax similar to a consumption tax just by setting the rate at zero for capital gains, dividends, interest, and estates. And guess what? We’re pretty close to that right now. Capital gains and dividends are currently taxed at 15% and the estate tax has been steadily decreasing for the past decade. Among major sources of investment income, only interest is taxed at normal rates, and even that applies only to non-retirement interest income. And how does this compare to other countries? It varies a lot, of course, but in addition to a VAT, most rich countries also levy a fairly stiff income tax that includes taxation of capital gains, dividends, interest, and estates. On average, their rates are about the same or higher than ours. It’s true that most European governments get a bigger portion of their revenue from consumption taxes than we do, but that’s because they have high VATs, not because they don’t have the other taxes. VATs are in addition to income and investment taxes, not instead of it. Second, be careful what you wish for. 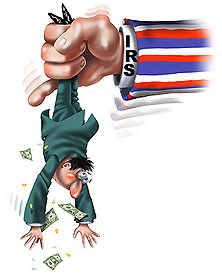 Investment taxes in the United States were at historic lows during the aughts, and that was also the decade that produced a huge credit bubble and, subsequently, the biggest economic crash since the Great Depression. Maybe that’s just a coincidence, but I wouldn’t bet the farm on it. There might be such a thing as incentivizing investment too much, after all.